10am - “Meet & Greet” & Light Breakfast of fruit, coconut yogurt, Vegan blueberry muffins & tea. 10:30am - Elaine Blanchard, Storyteller presents the history and evolution of her work - a powerful tool to promote inner and outer peace. 11am - Screening the Film “Inside Story” - Winner of a Regional Emmy Award, by Craig Leake and a talented group of film students at the University of Memphis, documenting Elaine Blanchard’s storytelling work with women inside the Shelby County Jail. Donations accepted to support Storytelling work and production expenses of making the film. 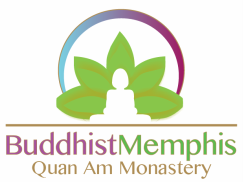 Donations for Quan Am Monastery also accepted.